Marê mirinê an maregîska mirinê (bi îngilîzî death adder) (Acanthophis), cinsekî marên mertal an Elapidae ji xijendeyên jehrawî li Awistraliya û Gîneya Nû dijî. Ji cinsê marê mirinê, heft cure hatiye dabeşandin gor Sîstema Întegrasiyona Agehiyên Taksonomî (ITIS). Acanthophis laevis William John Macleay, 1878 tune Marê mirina bipileyên nerm Îndonezya, Papiwayê Gîniya Nû. 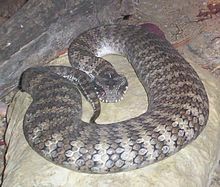 ↑ "Acanthophis". Integrated Taxonomic Information System. Retrieved 10 March 2011. ↑ a b Reptile Database (version 10 March 2011). Acanthophis laevis. ↑ a b Reptile Database (version 10 March 2011). Acanthophis pyrrhus. ↑ a b Reptile Database (version 10 March 2011). Acanthophis rugosus. ↑ a b Reptile Database (version 10 March 2011). Acanthophis wellsi. Ev rûpel cara dawî 24 gelawêj 2013, seet li 20:31an de hatiye guherandin.